If you, like me, were the recent recipient of an armload of blue-ribbon-at-the-county-fair-worthy summer squash, then most certainly you are, like me, currently thinking yourself spectacularly spoiled. But then, if you're one of those industrious types that grows their own squash, then maybe you're looking for a way to use up the proliferous buggers. 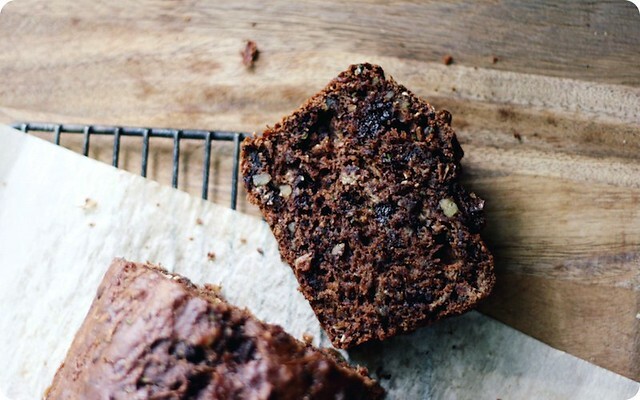 In either case, if need be, I may have the means to the end of your zucchini supply, specifically by way of chocolate olive oil zucchini bread. I had some difficulty with this bread, not in its making but in its naming, as while the sum of the parts is what we're all here for, each of those parts has an indespensible role to play. 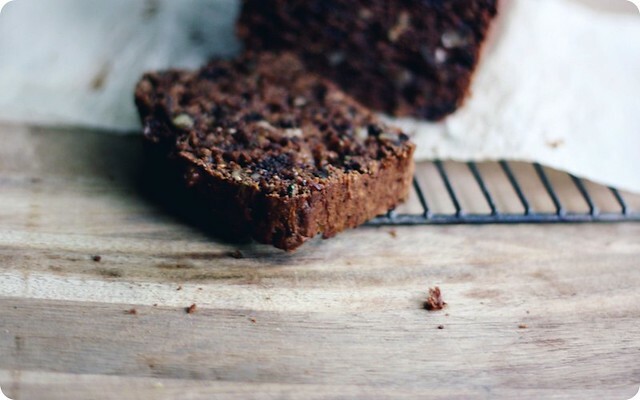 I put the chocolate first, because one glance at this quick bread and there's no mistaking the presence of cocoa. Chopped semisweet chocolate mollifies the tobacco-darkness of that cocoa powder; the irregular shards melt into the bread so that here and there within the crumb are damp pockets of sweetness. The olive oil is the surprise, tasting resiny and somehow green. The one I used makes me think of lemons and fields of newly-mown hay, which feels right for something you're baking at summer's height. The zucchini is, of course the main event, and so gets the glory of the final fanfare. There's a full four cups of it in the recipe, divided between two loaves. The pale shreds weave through the batter, so the resulting breads are gratifyingly bulging with bumps and crags, shot through and through with specks of green. It's a bread that does not pretend to be anything other than what it is, and that's an (albeit tasty) conveyance for terrific quantities of summer squash. All that said, I could have mentioned the walnuts. They're toasted, so that their fatty waxiness is made snappy and their aromatic bitterness is amplified. Along with the olive oil you've got a winner of a combination, so much so that the nuts were this close to headline status. The buttermilk too, it could have been up there in lights, because this bread would be so much less without the spring in the crumb - the crumb has weight without being weighed down, and the buttermilk's to thank for that. It steers the bread away from residence in the land of cake and clears the way for having some for breakfast. Exceptional with coffee, this bread's not so much suited to a fork, but instead the sort you use your fingers to break chunks off a slice, to be eaten in between paragraphs as you read the paper. There's what's left of a loaf on the counter and it's my plan for tomorrow morning. If you'd like, I'll set an extra place. The method for this bread is the standard muffin or quick bread style; wet ingredients stirred briefly into the dry. No mixer required, with two bowls and a spoon and you're set. Preheat an oven to 350°F (175°C). Grease two 9-by-5-by-3-inch loaf pans with softened butter. Use a length of parchment to line the bottom and long sides of the pan, forming a sling, and lightly butter the parchment as well. Set aside. Pour the wet ingredients into the dry, stir until combined, taking care not over mix. Divide the batter evenly between the two prepared pans and bake, rotating once, until a cake tester inserted into the loaf comes out almost clean, which should be around 50 minutes. Cool loaves in their pans on a rack for 20 minutes, then grasp the edges of the parchment to ease the bread out. If you can wait long enough to let them cool to room temperature before slicing, then well done. But if you can't wait, and cut the loaves into ragged pieces while still warm, then I can't say I blame you. For the zucchini, I use the grating attachment on my food processor, taking care not to press down on the feed tube plunger while the machine is running - this gives a light, feathery shredding. Since we want a bread that is damp but not sodden, I sprinkle the emerald-tipped strands across a (lint-free) kitchen towel, then place another atop, patting it down gently. After a few minutes the towels will have absorbed some of the excess liquid and the zucchini is left crisp and ready to go. If olive oil is not your thing, then it can be replaced by an equal amount of neutral oil or melted butter. With the latter, the bread will be denser and, as it lacks the mitigating edge of olive oil, it will taste sweeter as well.